Color(s): Shades of red-gold from pale honey to dark auburn; may have a white patch on chest. This breed of dog has been bred in Finland mainly to hunt all animals such as moose, elk, and even bears etc. It is of medium size and is very energetic. Essential elements of this breed include its beautiful red-gold color and fierce fox-like looks, along with erect ears and curly tail. In Finland, these dogs are still used for hunting purposes. However, in other countries they are famous as companion and pet dogs because of their affectionate and fun-loving nature. It is worth mentioning that they get along with the kids very well as well. 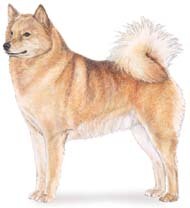 Since 1979 Finnish Spitz has been declared the national dog of Finland. The Finnish Spitz is a very healthy breed living for 13 to 15 years. However, it may suffer from a few dog disease which include Hip and elbow dysplasia, Patella Luxation, and Epilepsy.